For years, the 11th and 12 arrondissements, two formerly quiet, working class neighborhoods in eastern Paris, have been the preferred location for the French capital’s best young chefs. Why? Affordable apartments assure a hungry young clientele for the new restaurateurs who choose the area for its low-rent commercial spaces. Now a growing number of the city’s fledgling cooks are setting up shop in another atmospheric old working-class quarter: Montmartre, a hilltop district in the 18th arrondissement best known for the Sacre Coeur basilica and the artists who once lived and worked here — Toulouse-Lautrec, Utrillo and Modigliani, among others. Today, most of the action is on the back of La Butte (the mound, in French), as the locals call this spot in the center of Montmartre. 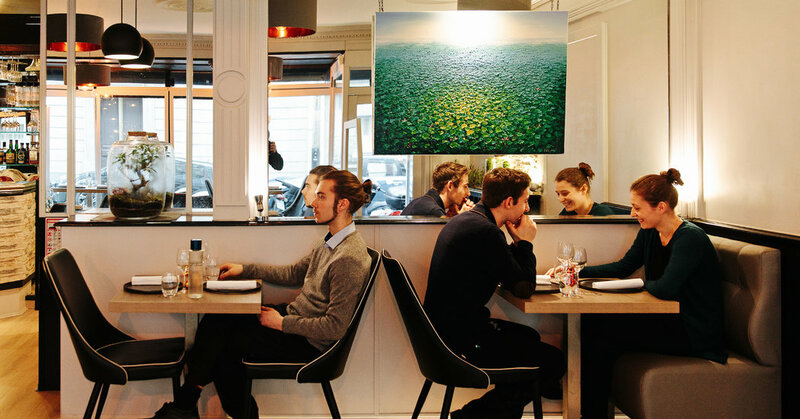 Here on the north-facing slope of the district, arty younger Parisians who’d rather spend their money on good food than rent are flocking to a wave of excellent new and reasonably priced casual restaurants, including one that was just awarded a Michelin star. Aside from the miniature Jeff Koons-style sculptures adorning the tables, this year-and-a-half old place on a quiet side street looks like countless unremarkable middlebrow neighborhood restaurants in Paris. The locals know better, since young chef Laurent Magnin’s superb contemporary French cooking had made it one of the capital’s most exciting dark-horse tables. In early February, though, it won a star in the 2018 Michelin Guide to France, so the secret is out. Still, the snag for some may be that there’s no a la carte menu here. Instead, they only serve multicourse, blind tasting menus, although food phobias and allergies are respected. The menu changes often but dishes like risotto garnished with veal-stock lacquered crayfish; grilled sea bream with peanut sauce and a deconstructed paella are as beautiful to taste at as they are to behold. Good value for the money, and open for both lunch and dinner on Saturdays, too. Supplied daily by the country’s Atlantic, North Sea and Mediterranean ports, landlocked Paris is one of the world’s best cities for seafood lovers. The hitch? The sparkling fresh catch of the day is generally expensive. This explains why this year-old spot in a slickly redecorated former hardware store has become such a hit — their high-tide menu is easy on the wallet. Start with some smoked haddock, Breton oysters or shrimp with homemade mayonnaise, and then go for dishes like tuna tartare with black rice, cabbage, radishes and trout eggs; scallops with watercress, ricotta, Granny Smith apple and dried black olives; or octopus with cockles, broccoli and poutargue (dried fish eggs). Great list of craft beers and natural wines, too. The puckish name of this year-old organic vegan-vegetarian bistro — an abattoir is a slaughterhouse — comes from the fact that this stylish light-filled restaurant was formerly a butcher shop. The menu changes often but runs to dishes like a starter of quinoa-sweet-potato-and-red-cabbage rolls, blanquette of seitan (chewy wheat protein) in sesame cream and rose-and-pistachio cake. A favorite French dictum is “Tout est bon dans le cochon,” or “Everything’s good from the pig.” For proof, come to this friendly bistro that celebrates the succulence of French pork in a variety of preparations, including an andouillette millefeuille, grilled pig’s ears with oranges and coriander, head cheese with capers and shallots, and pork belly roasted with citrus fruits. Non-porcine options include chicken-liver terrine, a catch-of-the-day fish and duck, and the profiteroles with vanilla ice cream and hot chocolate sauce should not be missed. Since it opened just over a year ago, this good-looking modern bistro with a market-driven menu, oak-plank floors and Scandinavian style furniture has become one of the popular tables in the neighborhood. The chef Romain Lamon and his team work at a small open kitchen in the back of the room, and their seasonally evolving menu runs to contemporary French comfort food that’s consistently light, inventive and satisfying. Expect dishes like ravioli filled with egg yolks and miso, braised beef cheeks with lemon-carrot purée, and a clever riff on crème brûlée that comes with roasted apples and crushed pecans. April 7, 2018 Comments Off on Unknown Tech Brands Aren’t Like Groceries. Don’t Just Grab Them.